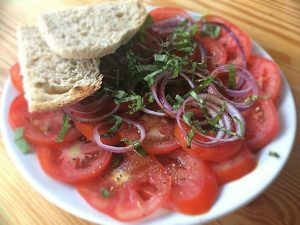 Finely slice Roma Tomatoes and place on a flat plate. Mix together diced basil leaves, balsamic vinegar, Olive Oil, sugar and pour over tomatoes. Allow tomatoes to sit covered in dressing for at least an hour or up to 8 hours before serving. Finely slice Spanish onions and cover tomatoes. Garnish salad with salt and pepper and fresh basil. Serve as a side dish, accompanies grilled chicken perfectly.